My barbecue grilled venison burgers recipe comes with a good dose of redcurrant jelly to give it a fruity flavor and added pork fat to help keep the results moist. My mate Jay shot a deer and because he's a completely useless cook he brought a good chunk of it round for me to cook for him. He brought a couple of haunches, one of which we spit roasted and the other made for a superb smoked venison roast . He also brought a load of what I would call “off cuts” that we ground up for this recipe. Venison comes from the deer (although moose and elk meat can also be classified as venison), a wild animal that has to fend for itself and survive predators, not one that has been farmed for its meat. The flesh of the deer is therefore muscular with very little fat. On the one hand, lean meat is good for you but it's got to taste good and "eat" well too. Without the addition of extra fat, a venison burger will be dry so in this recipe I've also ground up some pork fat and chopped some onion to add to the mix. My preferred mix is 70% lean meat and 30% fat so this is the mix that you will find in the ingredients. If you haven't already done so, read my article on making and cooking the perfect burger before you go any further. I don't normally put breadcrumbs in burgers but the redcurrant jelly can make the mix a little bit mushy so in this recipe I've added some breadcrumbs just to firm everything up and again help hold the moisture in. There's enough here to make 4 decent grilled venison burgers so if you want more, just multiply up the ingredients to suit your needs. The only allergen in my recipe is gluten but note that I've used a prepared redcurrant jelly, not one that I've made myself. If you do the same then please check the label for other allergens. Throw all the ingredients into a mixing bowl, roll up your sleeves and get your hands dirty! Give it a good mulch around so that everything is mixed. After that it's a simple matter of forming the patties and getting the grill up to temperature and brushed with a little oil to stop the burgers sticking. Grill for 5-7 minutes each side, and use an instant read temperature probe to ensure that you have hit the necessary 71°C (160°F). When cooked, take the burger off the heat and let it rest for 5 minutes so that the meat can relax and re-absorb some to the juices. 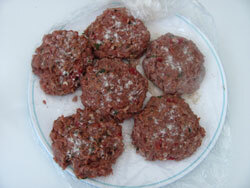 Now slap it in a bun and enjoy with crunchy slaw, a few salad leaves and your favourite homemade BBQ sauce recipe. TIP - When forming patties by hand, make them as thin as possible because when heat is applied to the meat, it contracts and the burger takes on more of a spherical shape. 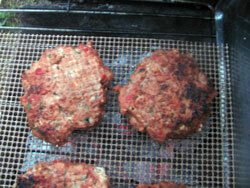 If you keep the burgers thin and even thinner in the center then they will stay burger shaped when they are cooked.